Adrenalin Snorkel and Dive is a family owned and operated PADI 5-Star Dive Centre, situated in Townsville. Our commitment to quality diver training, dive trips and the protection of our environment has established us as a premier operator in the Queensland dive industry. Our experienced, professional and friendly dive crew work hard to ensure your training with us is safe, comprehensive and lots of fun. Our PADI Divemaster Course is specifically designed to give the Divemaster candidate (DMC), the knowledge and hands on experience essential in finding gainful employment within the Dive Industry. This course involves comprehensive PADI eLearning theory, Confined Water and Open Water Training. After your confined water training you will be learning side by side with our qualified dive crew, on day trips and/or liveaboards to the Great Barrier Reef and SS Yongala Wreck. Throughout your course you will be evaluated in the pool and the ocean dives by our instructors. The PADI Divemaster course is your first level of professional training. Working closely with our PADI Instructors, you’ll fine-tune your dive skills and refine your rescue skills, so you anticipate and easily solve common problems. You’ll gain dive knowledge, management and supervision abilities so you become a role model to divers everywhere. · Emergency First Response Primary and Secondary Care (CPR and First Aid) training within the past 24 months. · A medical statement signed by a physician within the last 12 months. · At least 40 logged dives to begin the course and 60 dives to earn certification. · Note that qualifying certifications from other diver training organization may apply – ask your PADI Instructor. 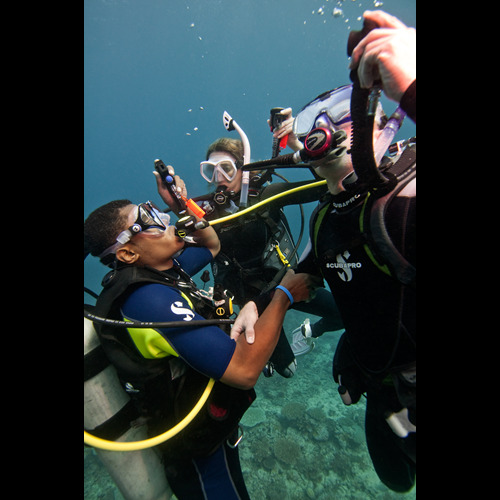 You may be able to get college credit for the Divemaster course, ask your instructor. Divemaster course are conducted with a minimum of 2 students.